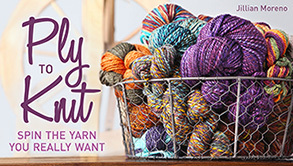 My Tour de Fleece is so boring – I’m spinning samples for my retreat with Beth and Rita and for my Rhinebeck classes,fun for me and my soon-to-be-students, but not a photo opportunity. So, I’m going to talk about not spinning. I decided to learn a new fiber art, embroidery. I’m one of those people who never learned as a child. I had an un-crafty mother who was forced to learn all kinds of crafts from her crafty mom, so we had zero craft in our house. I didn’t even take my first knitting class until I was 26. Instead of learning with a book all alone. I called up one of my friends, Kirsten, who wants to learn too and threw out an idea to learn together. 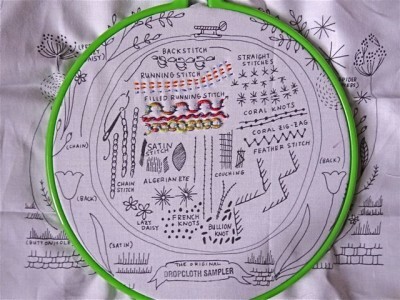 We’re taking the embroidery sampler with Rebecca Ringquist on Creativebug. I went out and bought all of the things for embroidery – floss, a hoop, needles, and most especially the lovely sampler from Rebecca’s etsy shop. Kirsten and I are meeting weekly-ish as schedules allow. 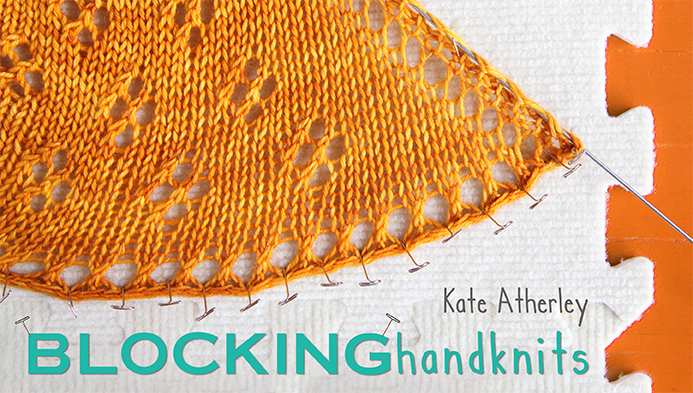 We watch one section of the class, then we stitch those stitches. 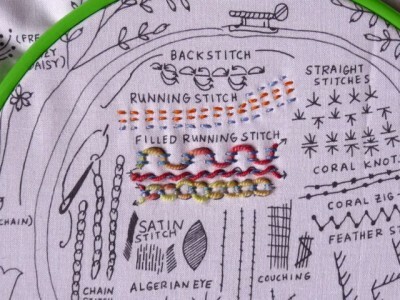 Our first class was running stitches. I love learning new things and there is something so relaxing about being a rank beginner, just following along, slowly. No spinning this week, but I am thinking about spinning embroidery yarns now. 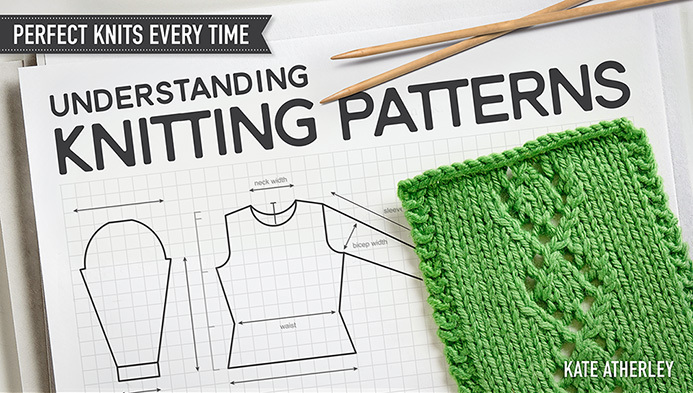 I didn’t take my first knitting class until I was 31 years old (though I had been knitting for about 3 years by that point). 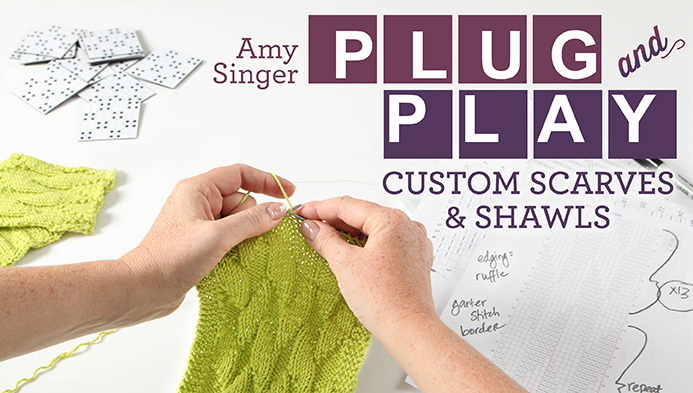 I am looking forward to your future post with updates on the class and your sampler, too. 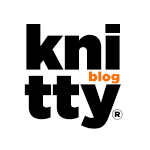 WWW: Upcoming European Fiber Festivals; Knitting Prime Minister Fuss; Cable Knit Floor Tiles!